They may fit in your lap, but cats are big, bad tigers at heart. Even domesticated cats are born hunters, and a new study suggests that indulging your cat’s natural instincts may be a boon to their health. But indulging their natural instincts doesn’t have to mean sacrificing the lives of mice or birds. Instead, cat owners can create a simple feeder puzzle which will allow their cat to play with their food before eating it. According to the study’s authors, this type of environmental enrichment may help offset some of the health issues associated with indoor housing (behavioral problems and chronic lower urinary tract signs, to name a few). Feeder puzzles require the use of a cats’ paws, as well as some degree of mental dexterity. They can help satisfy cats’ natural instinct to work for their food and even give them something of a pre-meal workout. The researchers noted that feeder puzzles helped one overweight cat lose 20% of its body weight within a year, while another cat who was fearful of people became less so following the introduction of the puzzles. See how to make a DIY version of a feeder puzzle in the video below. A quick tip from the researchers behind the study: in the beginning, consider overflowing the puzzle with food to make it easier for cats. 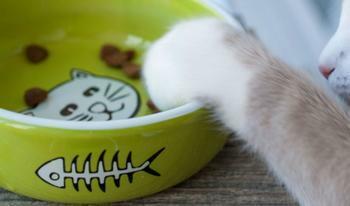 Once cats become more confident in their kernel-hunting abilities, less food can be added.